With one hand, Kremlin strangles non-governmental organizations in Russia. With another, it generously supports the defenders of its interests in the Baltics. Russia’s President Vladimir Putin knows what poses the greatest threat to the domestic stability in his country: it comes from foreign-sponsored nongovernmental organizations (NGOs) who serve as agents of the Russia’s enemies. In a speech earlier this year to the board of the Federal Security Service, Russia’s successor to the Soviet KGB, Putin said that the foreign-funded NGOs in Russia are run by Western and American special services, whose goal is to keep Russia under control. “They are already planning their actions for the upcoming election campaigns of 2016–2018,” he said. One year earlier, speaking to the same board, Putin warned the national security services that the West may use the foreign-backed NGOs to stir unrest in Russia. “Russia’s laws today give us the conditions we need for non-governmental and public organizations to work freely and transparently. But we will never accept their being used for destructive purposes,” he said. Following mass protests against voter fraud during the 2012 presidential election, Russia introduced a new law that requires NGOs with foreign funding to register as “foreign agents,” a term that conjures in the minds of Russians images of the Soviet xenophobia and paranoia. Since the law’s introduction, 74 NGOs have been listed as “foreign agents.” At least 10 well-known NGOs choose to dissolve themselves instead of being registered, according to closedsociety.org, an NGO monitoring group. One of the self-dissolved NGOs was the Dynasty foundation, which funds fellowships for sciences, summer schools and educational projects. In 2014, the foundation helped 288 physicists, 14 mathematicians, 21 biologists and 509 science teachers. The decision to label the Dynasty as “a foreign agent” which precipitated its shutdown sent shockwaves through the scientific community. The upper chamber of the Russian parliament, the Council of the Federation, created its own black list of the 12 NGOs, which includes Open Society Foundations (formely Soros Foundation), Freedom House, some foreign Ukrainian organizations and others. “The money is being distributed by the countries which do not consider Russia as a sovereign country, the countries that directly interfere in our domestic affairs through foundations, controlled by the security services,” the head of the foreign affairs committee in the Council of Federation Konstantin Kosachev said after the law was adopted. According to him, foreign financing of the NGOs in Russia to destabilize the situation nearly doubled in the period of one year, to 1.1 billion euros in 2014 from 589 million euros in 2013. What adds a hint of irony to Kosachev’s comments is the fact that up until the end of last year, he headed the Russian federal agency Rossotrudnichesvo, which together with three other “soft power” foundations is responsible for millions of US dollars in grants to NGOs tailored toward Russian compatriots living abroad. Rossotrudnichesvo, Russky Mir, Foundation for Defense of Rights of Compatriots Abroad and the Gorchakov Foundation for Public Diplomacy are all closed institutions and do not account for their spending. Re:Baltica with the Russian colleagues spent one year unsuccessfully trying to obtain information about grant recipients and amounts. The publicly available information shows that these organizations manage a budget of approximately 100 million US dollars a year. They have official representations in more than 100 countries: from Germany to Australia. The councils overseeing these organizations includes the government ministers, but also Putin’s friend, the outgoing head of the “Russian Railways” Vladimir Yakunin, or the head of the Paris-based Institute of the Democracy and Cooperation and former member of parliament Natalia Narochnitskaya. The latter two also oversee private foundations, which bankroll the promotion of the Russian foreign policy abroad. It’s an open secret in the Baltics that Russia financially supports local NGOs who defend its policies in Estonia, Latvia and Lithuania. The only unknown is how generous that support is. The investigation by Re:Baltica shows that there are more than 40 such organizations in the Baltic states that have received at least 1.5 million euros through legal means in the last three years, according to the most conservative calculations. That excludes cash transactions and financing through Russia-friendly enterprises and individuals. It is impossible to say precisely how much of their income is from the Russian government funds, because part of the recipients do not declare it in their annual reports. The Kremlin money lands in a narrow circle of friends. The Baltic security services identify those individuals and the organizations as key executors of the Russian foreign policy in their home countries. They all share some key features. They do not have significant alternative sources of funding, relying heavily on Moscow. 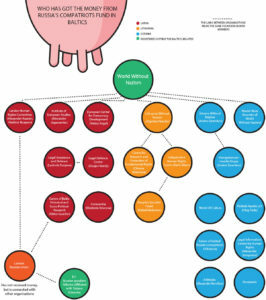 Approximately 68 percent of the grant recipients are somehow or another connected to the pro-Kremlin political parties in the Baltic states. Since some of those individuals also donate to political parties in Latvia, it cannot be excluded that the Kremlin money ends up in the coffers of these parties. Their goal is to influence the public debate and the society, said the head of the Latvian security service Normunds Mezviets. “They are being used as the agents of informational influence with the task to construct in the society messages that favor Russian interests,” he said in an interview to Re:Baltica. Three years ago, Re:Baltica investigated the work of the Russky Mir foundation in the Baltics. Our investigation had identified more than 20 recipients, who received around 170,000 euros to promote the Russian language and culture. The second fund – Foundation for Defense of the Rights of Compatriots Abroad – is the smallest of the four organizations. Nevertheless, it covers a wide array of activities. It’s funding goes to filmmakers that support and promote the Russia’s version of history of the 20th century; to researchers who accuse the Baltic states and Ukraine of human rights violations; for those who were tried of participating in the 2007 riots in Tallinn, the biggest riots in the Estonian capital since it broke free from the Soviet Union in 1991, and to active participants of the deportation of Lithuanians to Siberia. Since its creation in 2012 to mid-2014, when the foundation stopped publishing names of the grant recipients, it has named 21 NGOs in the Baltic states as the recipients of the grants in the Baltics. The true figure may be higher. 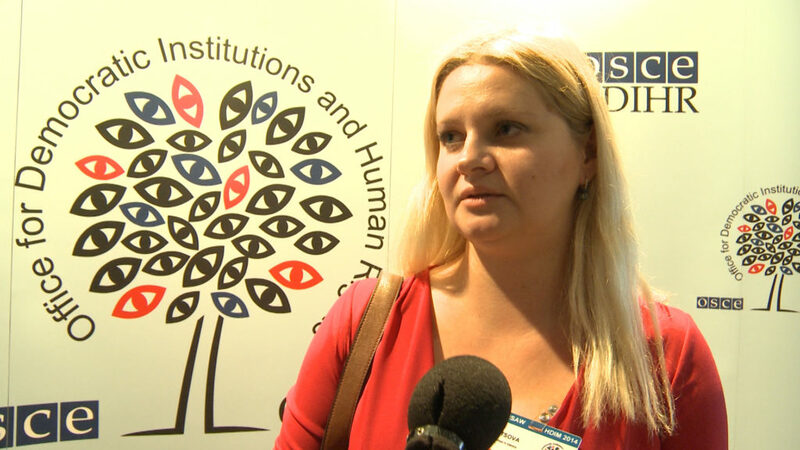 Estonia’s activist Alisa Blintsova told Re:Baltica that the foundation paid for her participation in the OSCE forum in Warsaw in the fall of 2014. However, her NGO, the Russian School in Estonia, was not named among the official grant recipients at the time. After publication of the article Re:Baltica was contacted by the representatives of the organisation, denying it has received Russian government’s money and claiming that Blintsova “was confused” while giving interview. According to calculations by Re:Baltica, the income of the named NGOs in Latvia and Estonia amounted to almost 1.5 million euros in three years (In Lithuania, the NGOs are not required to publish their financial data). It is very likely that this will be the last extensive annual report. After Re:Baltica began asking questions about the NGOs it funds, the foundation has stopped publishing names of grant recipients. The foundation lists nine Estonian NGOs and one individual — a well-known activist from Tallinn, Maksim Reva, whom the foundation supported as “a documentary film maker.” The NGOs received around 710,000 euros in grants in a three-year period. They do not report the sources of the grants on their annual reports. The largest recipient of the grants was the Legal Information Centre for Human Rights (LICHR, Inimõiguste Teabekeskus). The Estonian security services say the organization is a Russian agent, a charge the centre denies. Aleksey Semyonov, the centre’s head, however, says that part of the financing does come from the Russian embassy, the Russky Mir and the compatriot foundation, but the centre receives support from other embassies as well. The compatriot foundation grant money goes to pay for translating the Estonian laws into Russian. The NGO also receives funding from the Tallinn city government, led by a popular pro-Russian city mayor Edgar Savisaar, to provide legal help to many Russian-speaking residents in Russian. 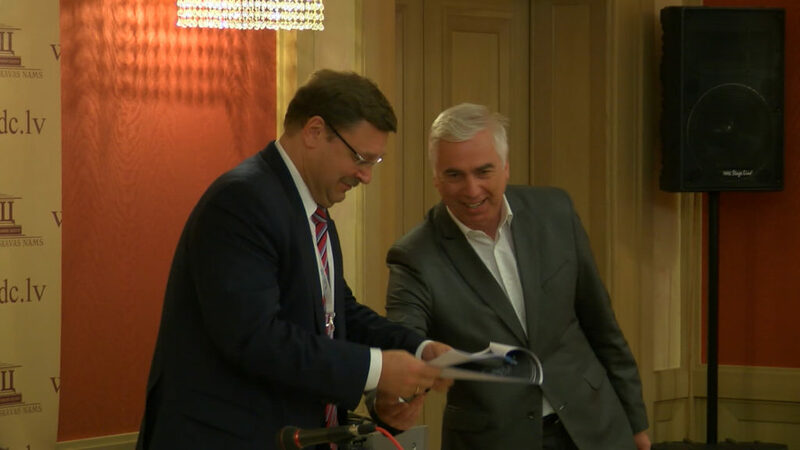 The second recipient of the Russian government funding is Andrey Zarenkov, who heads two organizations: Estonia Without Nazism (Natsivaba Eesti) and the Integration Media Group (Integratsioonimeedia Grupp). With one group, he protests against the rise of fascism in Estonia to showcase on Russian TV. The second group publishes the Baltiysky Mir (the Baltic World) magazine distributed through the Russian embassy and the compatriot organizations. By day, Zarenkov works as the head of the cultural centre in the small town of Maardu, near Tallinn. In 2014, he was tried on corruption and bribing charges because he had used the funds of the house of culture for his own purposes. Zarenkov had admitted his guilt in court, but later recounted, calling the case against him a political witch hunt. 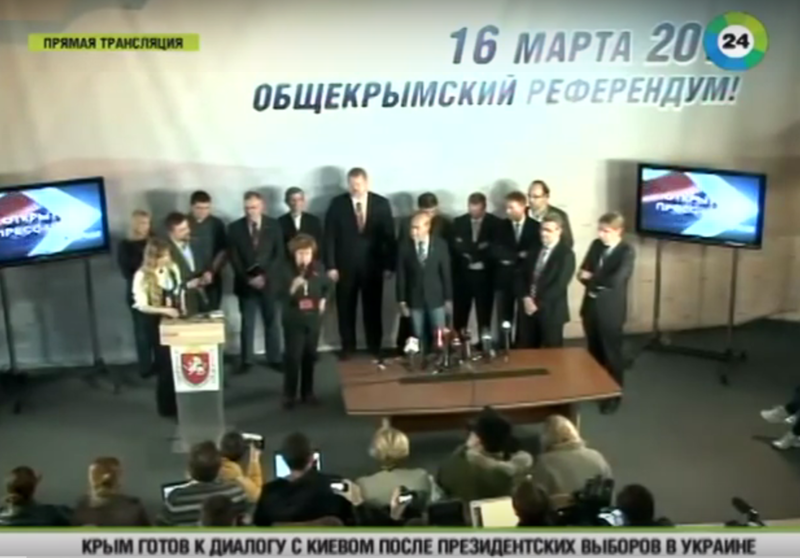 None of the Zarenkov’s attempts to be elected in the national parliament or local councils have succeeded. However, his NGO’s managed to attract more than 300,000 euros from unknown sources in spite of the political failures. Russia has also financed Paldiski Radio (Paldiski Raadio Liit), a small family business with two employees: Oleg Tesla and his wife. Paldiski was a former Soviet Navy nuclear submarine training center, the largest one in the Soviet Union. This is why until the Russian warship departure in 1994, the city was closed off. More than half of the Paldiski residents are ethnic Russians. The radio station is so marginal that it’s practically impossible to determine its audience share. The Teslas are not known in Estonia, even among the pro-Kremlin activists. The only time Tesla appeared in the Estonian media was when he participated in the Putin’s annual press conference in 2013 in Moscow. 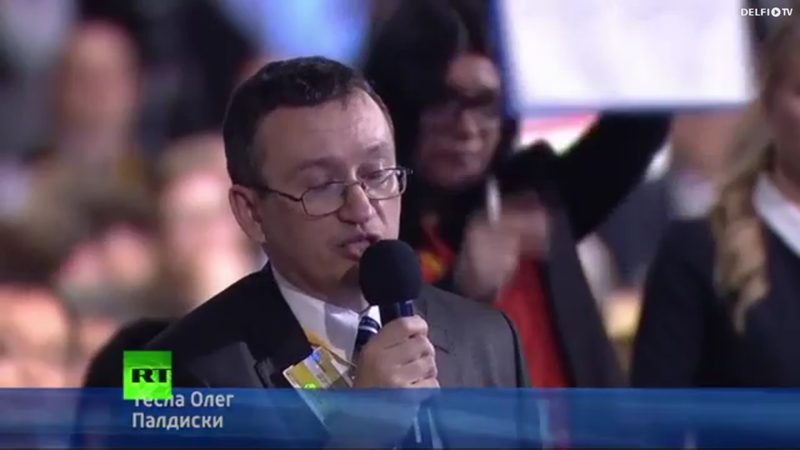 He asked a question about repatriation for people who one day woke up in a different country after the collapse of the Soviet Union. Putin started his answer in Estonian using a familiar language used by good friends: “Tere-tere, vana kere.” Tesla did not comment how he ended up at the press conference. Russia also finances the organization called Altmedia, which runs the internet site baltija.eu. According to the Estonian security service (KAPO), the project is funded via Media Capital Holding BV, a company registered in the Netherlands and controlled by people related to Russia’s state owned media giant Rossiya Segodnya. It claims one of the Altmedia founders is Vladimir Lepekhin, the director of the Eurasian Economic Community Institute, who, according to the KAPO, participates in the pro-Russian activities abroad. 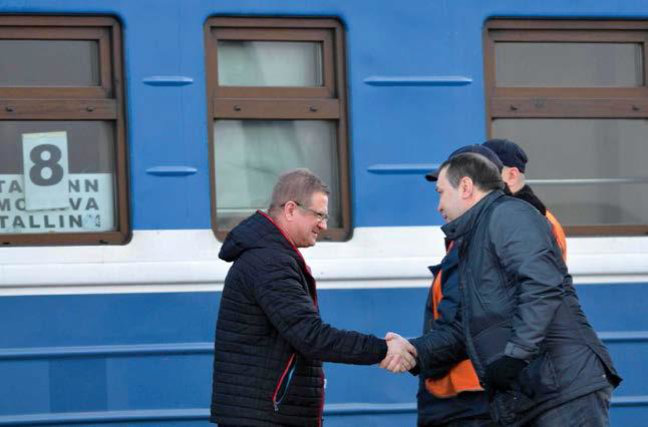 Lepekhin meets the editor of baltnews.ee, Aleksandr Kornilov, in the train station in Estonia. PHOTO: kapo.ee annual report. In Lithuania, the compatriot foundation finances three NGOs and one individual, who are interconnected and are monitored by the Baltic state’s security services. The precise information about the Kremlin funding is scarce because the Baltic state’s law does not require NGOs to disclose their sponsors. The State Security Department of Lithuania says the activities of the compatriot foundation and other groups are a threat to national security. “Members of the coordination boards [in the Russian embassies] and other pro-Russian activists have developed many centers, financed by Russia, to ‘protect’ the rights of the local Russians. In reality, these centers discredit the Baltic states internationally and encourage ethnic disharmony at home,” says the recent report published by the department. “These organizations’ ‘experts’ work according to the Russian interests, publicly accuse Lithuania (…) and make a contribution toward creating a negative image of the Baltic states in the eyes of the Russian society. In the future, this image may serve to justify an aggression against the Baltic states,” it says. Out of four organizations in the report, Re:Baltica found two on the list of those NGOs funded by the Kremlin: the Independent Center for Human Rights and the Centre for Defense and Research of the Fundamental Rights. The heads of both organizations are connected with Lithuania Without Nazism, a movement also funded by the Russian compatriot foundation. Rafael Muksinov. PHOTO: Vilnius municipality. Russia also funds organisations related to the Lithuanian politicians. Among them is Rafael Muksinov, who chairs the compatriot board at the Russian embassy. He was also recently elected to the Vilnius city council from the bloc of Valdemar Tomasevski, a party bloc led by a Polish Lithuanian politician. Muksinov, however, is not a member of the bloc. He is a member of the Socialist People’s Front, a radical left party. Until recently, the Socialist People’s Front was headed by Algirdas Paleckis, whose grandfather was the first leader of Soviet Lithuania after it was occupied by the Soviet Union in 1940. Paleckis was fined for alleging that in January 1991 it was the Lithuanian snipers not the Soviet troops who were shooting into civilians, who were defending the Vilnius TV tower against the storm by the Soviet troops. 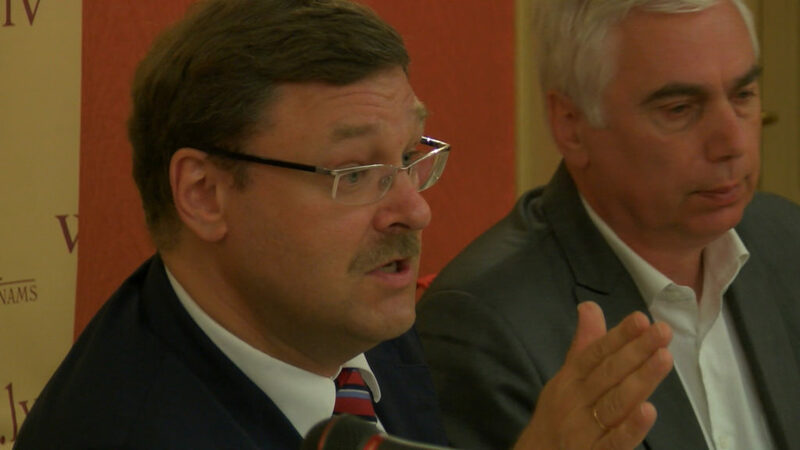 Paleckis also heads the Lithuania Without Nazism organization. So-called “antifascists organizations” in the Baltic states are part of the France-registered World Without Nazism, a global group founded by the Russian ex-politician and billionaire Boris Shpigel, who has close ties with the Kremlin. 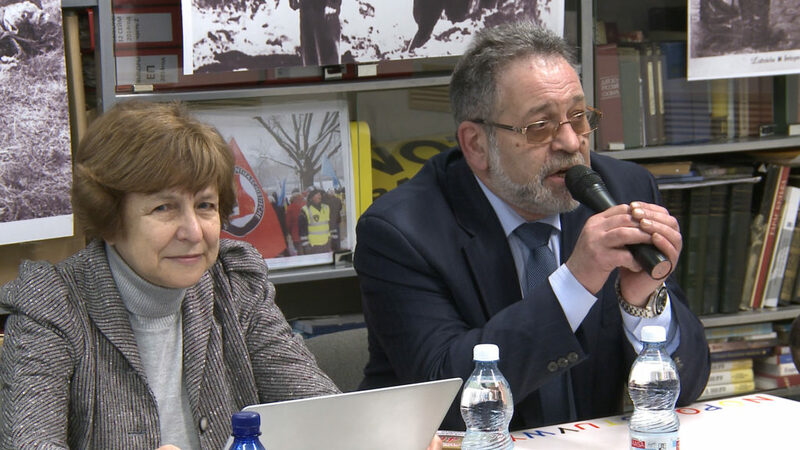 Among the official aims of the organization is fighting against the rise of Nazism and fascist ideas. However, in reality, the group often is used as a tool for the Russian foreign policy. Its public statements tend to match the views of the Russian Foreign ministery. The Russian compatriot foundation also sponsored the World Without Nazism inaugural general assembly in Strasbourg, in 2012. 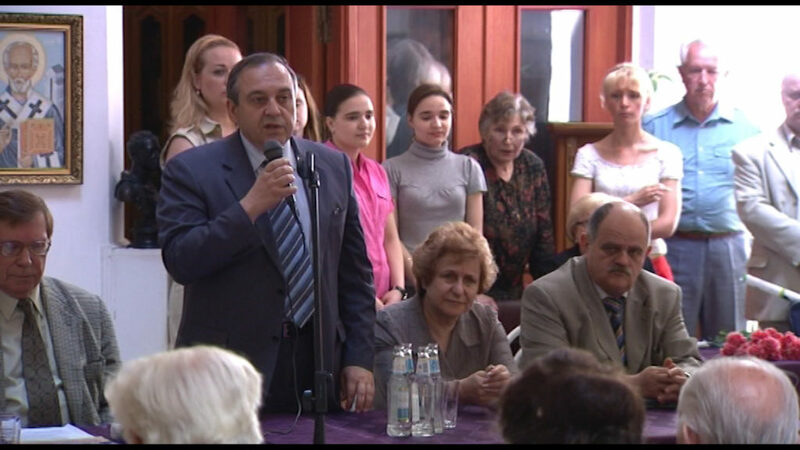 Muksinov also is one of the founders at the Independent Human Rights Center, headed by Karlis Bilans, also a member of Lithuania Without Nazism. Bilans is a regular guest on Russian TV, often accusing Lithuania of discriminating against local Russians. In December 2013, when student protests erupted in Ukraine against the corrupt regime of President Viktor Yanukovich, the centre received 15,000 euros from an unnamed source. 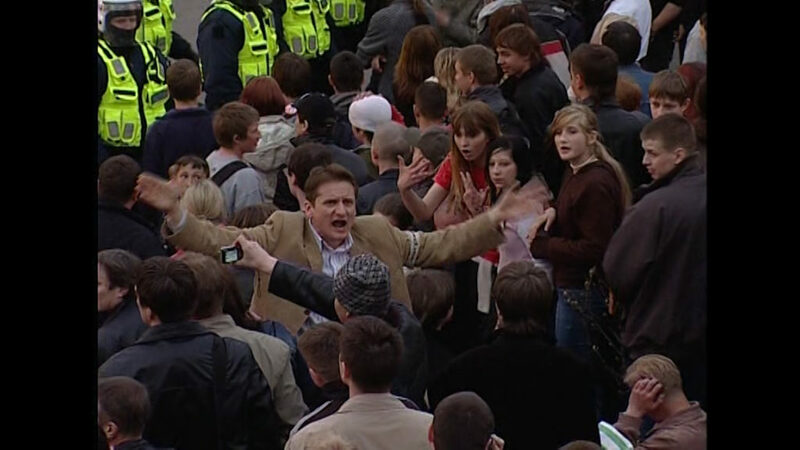 A few months later, Bilans took part in protests in Vilnius against Lithuania’s support for Ukraine. They all refused to comment for this article. Another founding member of Lithuania Without Nazism is Oksana Bekeriene, the head of Centre for Research and Defense of Fundamental Rights. The centre has a wide range of activities, starting with criticism of Lithuania at the OSCE meetings and ending with a children’s competition Thank you for giving life devoted to the soldiers of the Red Army, who defeated the Nazi Germany. “If the [US] State Department gave us money, we would have taken it anyway. However, this is not Russian money, it’s the foundation’s,” she told Re:Baltica at the OSCE session in Warsaw last September. 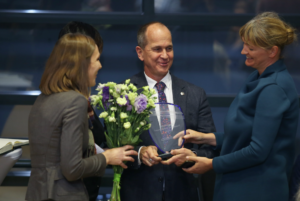 Out of seven grant recipients in Latvia, four have acknowledged them in their annual reports. The remaining three refused to discuss the amounts. The total funding for these organizations could be more than 680,000 euros. The annual reports show that the lion’s share has been received by Latvian Human Rights Committee, founded by the Latvian MEP Tatjana Zdanoka. Organisation itself confirms that it has received over 224 000 euros. Officially, the NGO fights for the rights of the national minority and renters, who are mostly Russian-speakers who have remained living in the denationalized apartment buildings since the 1990s. However, in reality the group is the mirror image of the Russian Union of Latvia, a political party. Formerly known as For Human Rights in a United Latvia, the party led by Zdanoka changed its name after the Russian annexation of Crimea, which turned many in the Russian political class patriotic. While Zdanoka herself is no longer a board member of the Latvian Human Rights Committee, the annual reports suggest that the NGO is supported by Zdanoka and Moscow. Most recently to hide the source of funding its Baltic supporters, the Kremlin has been using NGOs registered in other EU countries, where the transparency requirements are lower. This fact becomes evident on March 16, a day when Latvia unofficially commemorates the fallen Latvian soldiers, who fought on the side of the Nazi Germany in World War II. The veterans and their right-wing supporters march in central Riga to the Freedom Monument, where the antifascists stage counter-protests against what they see as rise of fascism. They also hold conferences and roundtable discussions. This year, the anti-fascist event was dubbed as “the international roundtable discussion about the rise of Nazism in modern Europe with legal experts from at least five countries.” Out of nine experts, seven represented the Kremlin-bankrolled NGOs. 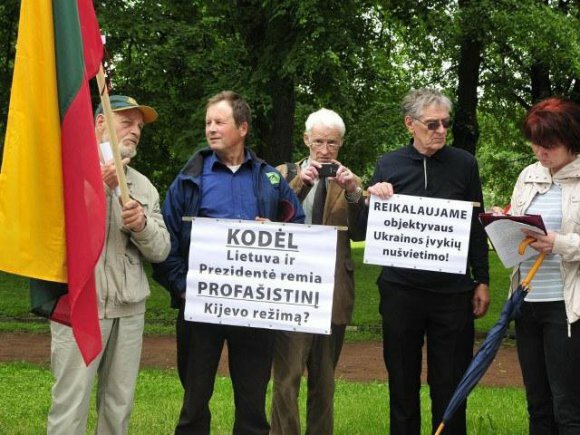 Before March 16, Latvia’s security services had said the foundation for compatriots has awarded 25,000 euros to the Belgium-registered organization, Pour La Future Sans Fascism, founded by Zdanoka and Baltic state’s main anti-fascist Josef Koren among others. 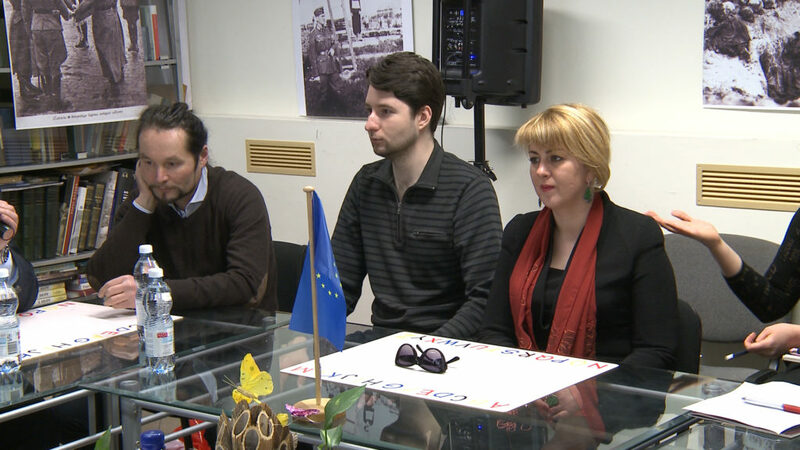 Their group signed a contract with a Latvian NGO about the March 16 protest. 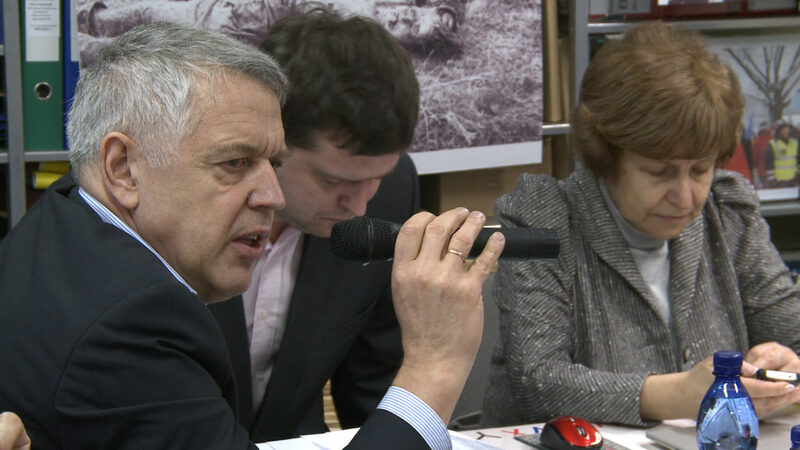 The participants of the round table discussion were Zdanoka’s friends: her party colleague and a Latvian Human Rights Committee board member Vladimir Buzayev, her assistant in the European Parliament, another LHRC board member Aleksandr Kuzmin. The discussion was led by Koren. Koren is not a board member of any NGOs, however he previously kicked out Latvian Public TV journalists after they began asking questions about the funding. A regular attendee of these annual roundtable discussions was missing this year. Valery Engel, a Russian historian, who in Latvia also deals in real estate, usually participated as the World Without Nazism vice president. 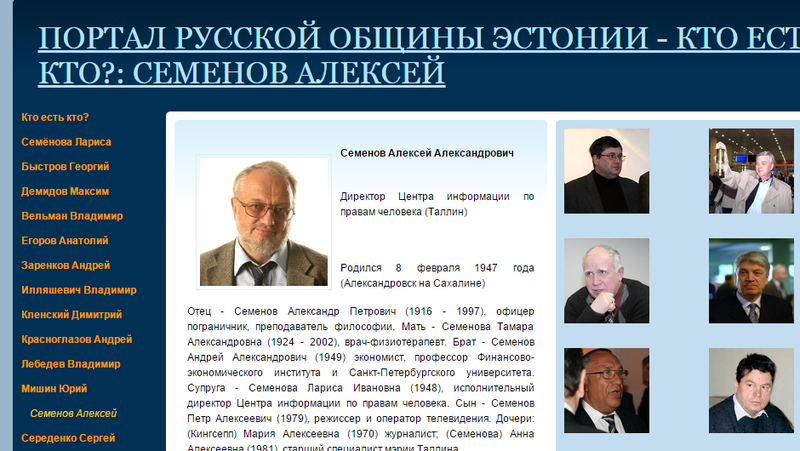 His own NGO, Centre for European Democracy Studies, is on the list of the recipients of the Russian government grants. In three years, this Latvian-registered NGO received over 100,000 euros from sources which are not disclosed in the annual reports. Engel refused to discuss it and announced that he has left World Without Nazism. However, NGO work is barely noticable in Latvia. The state revenue service had started an audit of his NGO. The tax authorities refused to disclose the details of the investigation or to say if they were targeting other pro-Kremlin NGOs. Viktor Guschin, another participant of the roundtable discussion, was the coordinator of the council of the Russian compatriot organizations at the embassy of Russia in Riga. He had unsuccessfully tried to get elected in the Latvian and European parliaments. He is also the head of the Centre of Baltic Historical and Socio-Political Research. The group publishes books about the discrimination of the Russian speakers in Latvia and portrays Latvia as a failed state. The annual reports suggested his received over 78,000 euros from various sources, including Russian consulate in Latvia. Aleksandr Gaponenko, a man who represents many several NGOs in Latvia, also participated in the roundtable discussion. He receives his share of the Russian money through his European Research Institute. 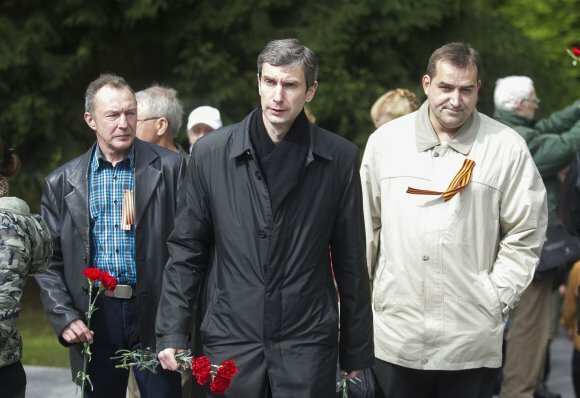 Since he is a Latvian non-citizen, he cannot run for a public office, however the opposition party Harmony, which draws on support from the Russian-speaking community, nominated him as a shadow minister of economy at the peak of the global economic crisis more than five years ago. The security services identify Gaponenko as the key ideologue of the failed 2012 referendum on making Russian the second official language. This summer, the law enforcement agencies have launched a criminal investigation against him for spreading hate on the Internet. On his Facebook page, Gaponenko said that the US tanks arrived to Latvia not for training exerises but to destroy the local Russian community. To alJazeera TV channel, Gaponenko said that the Russian foundation paid him 7,000 euros. However, the annual reports say that organisation has received more than 29,000 euros in 2014 alone from undisclosed sources. Any internationally significant research by his institute cannot be found on the Internet. Among the participants of the roundtable was also Lithuania’s Oksana Bekeriene, who sat quietly. 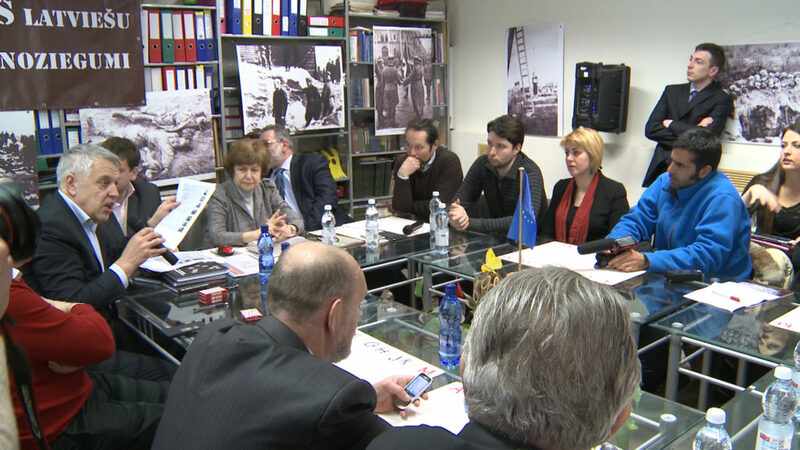 Other international “experts” were a small Italian town mayor, who renamed a local park after the Odessa “martyrs” to commemorate the deaths of more than 40 people inside the Trade Union building in a Ukrainian town, and a representative of the now-defunct anti-globalist movement. Zdanok herself denied that the Kremlin could have paid for the March 16 protests. She said the organization had asked for funding, but received a rejection. “My position is that I am an anti-fascist and I don’t know why you think this is a Russian position. This is all European states’ position. 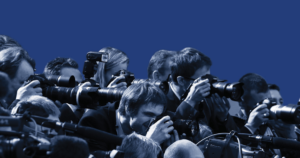 Your question is a provocation,” she said to Re:Baltica journalist. Meanwhile, the Baltic states are slowly tightening their screws on the Kremlin-backed NGOs. The most active Kremlin activists get travel bans to neighboring countries. For example, Maksim Reva was deported from Latvia and Lithuania. Lithuania recently threw out Kuzmins and Korens. Gaponenko was denied entry and slapped a travel ban to Estonia, a move that drew condemnation from the compatriot foundation and people like Dmitry Yermolayev, whom the Latvian security services identified as an officer of the Federal Security Services (FSB) and who worked at the Russian embassy in Latvia under the diplomatic immunity. The Russian foreign ministry called the travel ban the persecution of the dissidents. Rossotrudnichesvo has complained that only Turkmenistan and the Baltic states are not allowing the Russian agency to open up official representation offices. “The goal of these organizations is not to build cultural ties and public diplomacy in its best sense, but rather to serve as a conduit for the Russian foreign policy through the local Russian community as well as the instruments of the political influence,” said Latvia’s foreign minister Edgars Rinkevics in an interview to Re:baltica. This is supported by the money flow and other countries’ experiences, where Russia actively works with the local Russian community, he said. 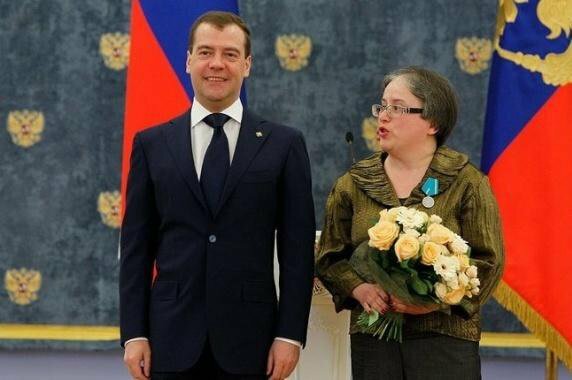 Since then, Russia has created two more foundations to finance NGOs abroad. 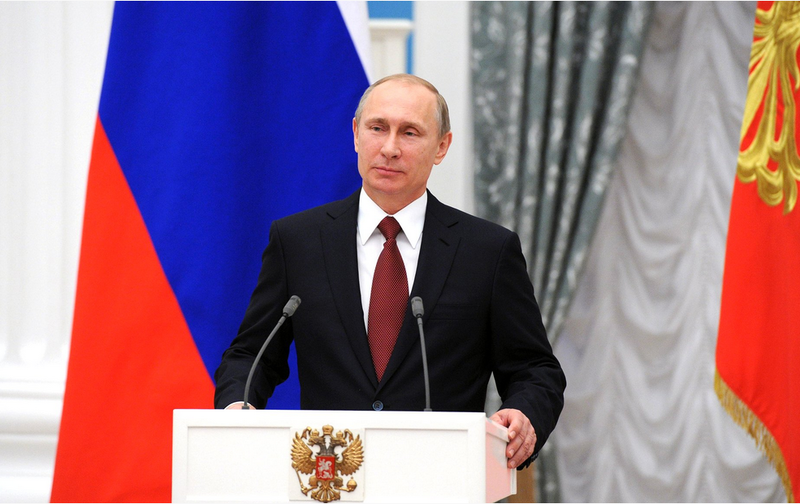 At the end of last year, Russia created a foundation to support Russian-language media abroad. Moscow also plans to create a foundation charged with the promotion of the Russian version of history abroad. According to that theory, the Soviet Union liberated Europe from Nazism and not erected the Iron Curtain over eastern Europe.